Report: Microsoft Xbox One may be getting DVR capability this year. Last week the over-the-air (OTA) tuner for the Xbox One hit stores and I decided to give it a try. While the tuner is normally $59.99, Microsoft was offering a bundle that included it and a $70 Mohu 50 antenna for $100 and that's what I opted for. A post at Xbox Wire suggests heading to gomohu.com/xbox first to make sure you're going to get a good experience. That page told me the Mohu 50 should get 31 channels at my address. For the most part I was interested in the major networks since I was exploring my cord-cutting options and most of the other channels I watch I could get via Sling. 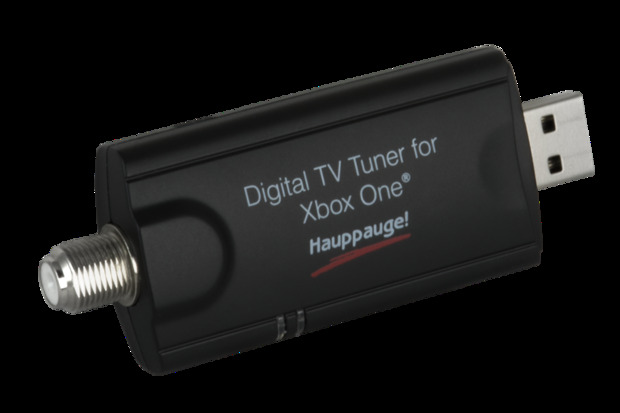 The tuner itself plugs into a USB port on the Xbox One, then a coax cable runs from it to the antenna. As part of the setup you're asked for a zip code (for TV listings), then it scans for channels and finally you're asked if you want to devote 4 GB of hard drive space to allowing you to pause live TV for up to 30 minutes (as of now there is no DVR function, just a 30 minute pause). The tuner comes with a small antenna rated for 10 miles. Using that I got 9 channels, which made me pretty happy I'd sprung for the bundle. While I didn't get the promised 31 channels, I did get 20, including most of the channels I was looking for. In particular I got a few PBS stations, NBC, CBS, FOX and even a CW station. The one disappointment was ABC. After several re-scans I finally got a local ABC affiliate to appear but it's not at all reliable. In Mohu's defense, I live in an apartment building on the south side of the city, and the window closest to the Xbox One faces south. That's where the antenna is. In other words it's pretty much facing directly away from the city center where, presumably, most of the broadcast towers are. I have other apartments to either side of me and it's a long run to a north facing window that opens onto a closed-in porch so this south facing window is the only viable option for me at this point. I'll give Mohu the benefit of the doubt and assume if I owned a house and had more options I could pull in the 31 stations it says I can get. I do still have cable TV service that I route through the Xbox One via HDMI pass-through. One of my concerns was that I'd have to opt for either the cable/HDMI set up or the OTA via USB set up, but that fear proved unfounded for the most part. The two co-exist pretty nicely. Of course most of us have our Xbox One consoles plugged into televisions that already have built-in tuners. We could just buy a Mohu (or some other antenna) and go directly to the TV. What benefit does the Xbox Tuner provide? First of all, the Xbox One includes One Guide, a channel listing service. I definitely don't want to go back to the days of flipping through channels to see what's on. Speaking of One Guide, with both the OTA antenna and cable service running through the systems, One Guide lists OTA channels first and then the cable channels, which leads to my one issue with having both cable and OTA connected. If I use voice commands via Kinect (e.g. "Xbox, watch ABC") the system will tune to the dodgy OTA ABC station I mentioned rather than ABC via cable network. That definitely feels like a #firstworldproblem, though. I can of course also tune to the station I want manually. Back to the good stuff. The second benefit of using the Xbox tuner is the "Pause Live TV" feature that I already mentioned. That's another feature I really don't want to give up. Third is just the convenience of having everything coming through one input on the TV. It makes jumping between TV and another service super fast and you can even use the Xbox One's Snap feature to watch TV while you play a game. Last, one of the neatest features of the OTA Tuner is that you can use it to stream live TV to Microsoft's Smart Glass app which runs on Windows, iOS and Android. It works very well for me. (I should note that my Xbox One has a wired Ethernet connection.) In fact you can stream TV to Smart Glass while you (or someone else) plays a game on the Xbox One. Overall I'm fairly pleased with this setup. My biggest gripe comes down to what I can pull in via the antenna and that's not really a complaint against the tuner itself. You might ask why I need both OTA and cable, and the fact is I really don't. I mostly picked up the tuner to see how well it worked, to see how feasible it would be for me to cut the cord without giving up the shows we enjoy, and in anticipation of Microsoft one day adding DVR features to it. The fact that I can't pull in ABC puts a kink in my 'cut the cord' plans for now. On the other hand, streaming live TV to Smart Glass is a neat feature that I look forward to using now and then. I'm also looking forward to football season; when the OTA signal is strong the picture is better than what cable provides and that's probably how I'll watch football this season. And of course the $100 I spent is a one time fee. Everything I do with the tuner and antenna is free from here on out. Before taking the plunge it's worth taking the time to go to GoMohu or AntennaWeb to see what channels you can get. Just keep in mind these sites assume ideal antenna placement. If you're a homeowner you can probably find the perfect spot but if like me you're in an apartment your options might limit the number of stations you can pull in.